Tsubaki offers lube-free chain. 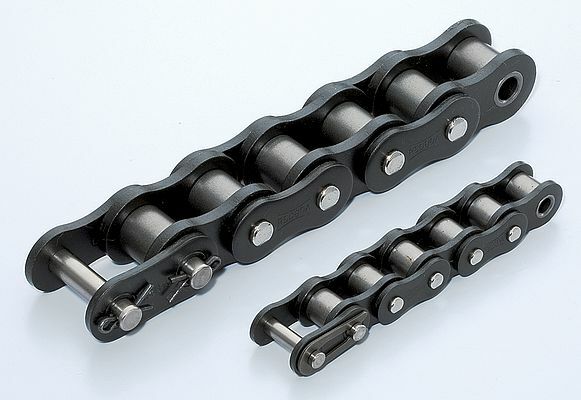 Its Lambda chains were the first in the industry to use oil-impregnated sintered bushes and have become the de-facto chain choice for many applications, including extreme temperature versions and food safe options with a food grade lubricant supplied as standard. Lambda also runs clean thus reducing the risk of contaminating products, machines, work space areas etc. Further the detailed design of the chains components makes assembly and disassembly simple and fast, so that machine stoppages are minimised. Importantly Lambda is interchangeable with many other chain types; thus machinery can benefit from a significant upgrade in performance simply by changing to Lambda. Our main products are industrial drive chains, attachment chains and large size conveyor chains. Related products such as cam clutches, sprockets, shaft couplings, safety devices, toothed belts & pulleys compliment the program. In the new and modern workshop in Dordrecht, standard attachment chains can be assembled as ready-to use items, thus saving customers time and achieving highest quality. In case of special needs it is possible to manufacture chains completely to order. Tsubakimoto Europe B.V. serves the Pan-European market, Africa and the Middle East. Our headquarters are located in Dordrecht, the Netherlands, serving Power Transmission customers. Our subsidiary located in Nottingham, United Kingdom, houses an additional office and warehouse supporting the Power Transmission market in the UK & Ireland. Tsubaki also has a German subsidiary in Gilching. The Tsubaki Group includes 28 production locations and 22 group companies worldwide. Our production and sales networks are now more developed than ever.